Wix is a site builder and a direct competitor to Squarespace. It’s an all-in-one solution that comes with everything the average person needs to design, build and manage their own website without having to hire a developer or learn how to code. Wix offers an ecommerce platform in some of its plans, and that’s what we’re going to focus on. Let’s take a look at some of Wix’s best advantages and worst disadvantages to see how it performs as an ecommerce platform. Let’s go over who Wix is and what they’re about before we dive into the pros and cons of the platform. Wix was founded in 2006 and had over 1 million users by 2009. It now has over 90 million users and has changed the design of its editor several times throughout its short time as a company. Its current editor allows you to build your very own website with ease, and it has over 500 custom-made, ready-to-use templates in its repository. As for the team? They’re over 1,200 strong and operate in over 10 offices around the world, including offices located in the United States, Israel, and Germany. Let’s get to that pros and cons list. Wix is primarily a site builder, as stated earlier. Let’s examine some of its best features in terms of what it has to offer as an ecommerce platform. 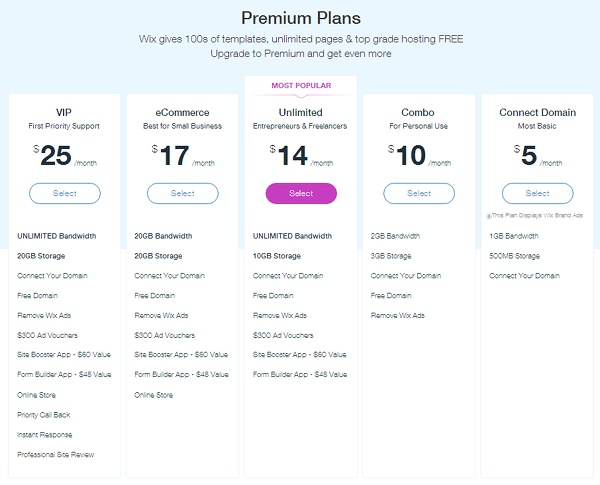 Wix is a dedicated, all-in-one site builder, which means it provides hosting and themes you can use with a few simple clicks, giving just about anyone the ability to build and design their own websites. As far as ecommerce goes, it offers integration with popular payment gateways, including PayPal and Stripe, features that allow you to manage your inventory easily as well as security features. It also offers plenty of well-designed templates designed specifically for ecommerce. Wix sites are incredibly easy to set up. They offer a number of different well-designed templates, all of which can be customized using the built-in, drag-and-drop editor. This editor allows you to customize the fonts your site uses, the colors it has as well as its overall layout. Freemium basically means the base version of the app is free but can be built upon by upgrading at a premium price. A few popular apps include Instagram Feed, Wix Bookings, 123 Form Builder and Site Search. You can already see that this platform isn’t meant to host large ecommerce stores with several departments and large inventories as its server capabilities aren’t as expansive and powerful as they could be. However, the pricing is pretty spectacular for small to medium-sized businesses. You’ll receive $300 worth of ad vouchers when you pay annually for either of these plans, which breaks down into $75 for Google Adwords when you make a purchase of $25 or more, $100 in Bing Ads and $125 in local listings. Rates can be determined by weight or order price. Wix offers a variety of different ways to serve their customers. This includes support in the form of phone calls and a ticket system. Customers of the ecommerce plans are even eligible to receive priority support. If your problem is common or basic, you may even be able to solve it yourself using the vast number of articles available in the Wix knowledge base, the Wix blog and even help from fellow users in the community forums. Wix allows you to sell physical and digital products, and creating products is really simple when you use the intuitive UI of Wix. You can give your product a name, assign it a ribbon, such as New or Sale, give it a base price and a sale price as well as a description, SKU code, weight and additional text for specific details, such as a return policy. You can enable a couple different settings to allow customers to receive a customized version of your product or a specific variant of it. 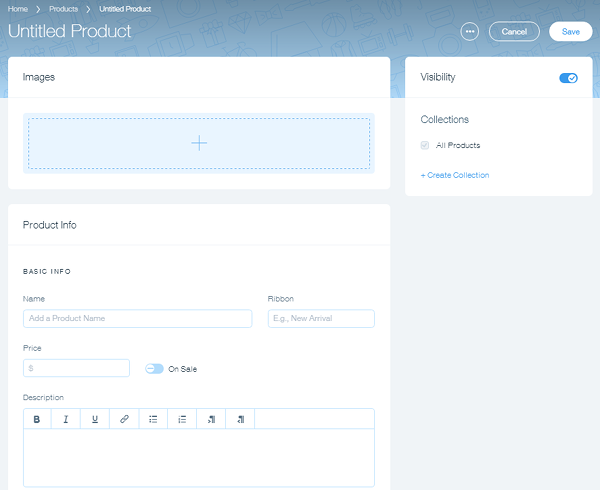 These settings include a Custom Text feature, which you can enable on product pages for customers to fill out with custom text they want on their products. You can also add different options to products, separate those options into different lists and give each individual option an extra charge. Wix is an all-in-one site builder first and foremost, as I said before. It doesn’t offer as many powerful ecommerce-heavy features as it could because of this. The lack of such features may deter some developers and store owners from considering to use Wix as a platform for their stores. Let’s examine them. The reporting and analytical features in Wix are very poor and even non-existent when compared to such dedicated ecommerce platforms as Spotify and BigCommerce. This platform has no sales reports nor does it have any native analytical data. They suggest integrating your store with Google Analytics, but this only solves the issue of finding out who is visiting your shop and how they’re getting there. You can even install a popular app called Visitor Analytics to view real-time website stats, click paths and other types of data. 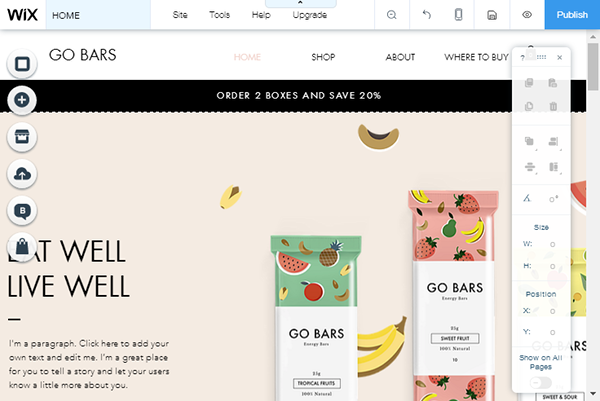 The lack of a built-in analytics feature is forgivable, but the inability to generate sales reports within Wix is a con holding it back from becoming a reliable source for ecommerce. Without these types of reports, site owners cannot see a breakdown of their orders and generate one within seconds. This is especially tedious for stores that have processed thousands of orders. The lack of these types of reports also means store owners cannot use hard data to recognize trends in their stores or give them the data they need to make smart decisions when it comes to offering sales, satisfying valuable customers and effectively moving products that haven’t been selling. One of the biggest faults Wix has is its inability to integrate with shipping carriers. We discussed the shipping methods and types of rates you can offer to your customers in the pros section, but something you cannot do with Wix is offer real-time shipping rates from the carriers you use. This also means you can’t print shipping labels at home or receive special discounts for these carriers as you can with other ecommerce platforms. The platform doesn’t even have an app for a third-party shipping tool like ShipStation. Unfortunately, the lack of these features makes shipping orders highly tedious and a lot more difficult than it needs to be. We already knew its cheap premium prices and lack of advanced reporting and shipping features makes Wix a poor platform for larger businesses, but it may also be a poor platform for small to medium-sized businesses with diverse inventories. This is due to its lack of a proper category system. You cannot add parent and child categories to Wix. You can only create what the platform calls “collections.” So, instead of having a parent category called Mens and child categories called Tops, Bottoms and Shoes, you’d have collections called Men’s Tops, Men’s Bottoms, Men’s Shoes, etc. This may not be a big deal for some, but the lack of a proper hierarchy system for categories can make inventory management a nightmare for certain stores. Business is always changing as are buying trends among consumers. It’s a smart idea to spread out your sales among multiple channels because of this. However, you cannot do this with Wix. There’s no point of sale nor are there any integrations that allow you to sell your products on social media, such as a store on Facebook or a Buy Now button on Pinterest. It does integrate with eBay, so you can at least sell the products you’ve created in Wix on eBay’s marketplace. Creating products is easy with Wix, but unfortunately, the service does not have an SEO section on the new product page interface. This prevents you from giving products individual SEO titles and meta descriptions to optimize the way they appear in search engines. Wix is primarily a site builder, as I’ve said many times throughout this review. It’s meant to give non-tech savvy folks the ability to design, build and manage their own websites without having to rely on a web developer, something that’s necessary if they don’t have the budgets to do so. Its shortcomings are to be expected because of this as merchants are not their target demographic. However, if you wish to use Wix as a platform for your online store, be aware of the features it lacks before you set things up to ensure you don’t create a headache for yourself later on. If you own a large eCommerce store or plan to grow yours to this size, you’ll be better off looking at another platform, such as Shopify, BigCommerce, WooCommerce, LemonStand, or Magento. If you don’t plan on having a large inventory but plan on processing a lot of orders, consider if the lack of sales reports and other data will affect the efficiency of your business. The number of orders you process may also have an affect on how important the lack of shipping integrations is for your business. You should also consider if the inability to create parent and child categories will have an affect on the way you manage your inventory. Wix is a simple platform that makes it easy to create a well-designed eCommerce site. I highly recommend it if you only plan on building a simple store. Click the link below to check it out.